Regarding throws from the infield that go out of play, umpires must determine if it the “first play” or “second play.” By rule, when an infielder initially fields the ball, that is NOT A PLAY. The infielder’s “first play” is either: (1) a throw to a base (most common), (2) an attempted tag of a base (running to a base), (3) attempted tag of a runner, or (4) receiving a throw, usually to start a double play. A muff or an error when initially fielding a batted ball is not a play. When an infielder’s “first play” is a throw and the ball goes into dead ball territory, all runners, including the batter-runner are awarded two bases from their position on the bases at the start of play which is when the pitch is delivered. (EX: Runner on first is running with the pitch when the batter hits a ground ball to the shortstop who air mails the ball into DBT. At the time of the throw, the runner is on second base. Because the throw is the “first play,” the runner can only be awarded third base, two bases from his original base at the start of play. When the throw into DBT is the “second play” in the infield, all runners are awarded two bases from their position on the bases at the time of the throw. (EX: runner on first is running with the pitch when the batter hits a ground ball to the shortstop who attempts the 6-6-3 double play. But the runner beats the shortstop to second base. The shortstop then throws the ball into DBT. The shortstop’s “first play” was his attempt to tag the base. His “second play” was the wild throw into DBT. Therefore, the runner who reached second base would get two bases and score because he had that base made at the time of the throw. With all that in mind, let’s look at the following play and you can place the runner in question. The A’s hosted the Giants on July 22. Franklin Baretto was batting in the bottom of the third with the bases empty and no outs when he hit a shot that deflected off pitcher Johnny Cueto’s glove. The ball was recovered by first baseman Brandon Belt who threw wide of Cueto covering first. The ball got by Cueto and was rolling toward the dugout when catcher Nick Hundley unintentionally deflected the ball into the dugout. That’s two separate deflections on the same play. The umpires awarded Baretto second base. A’s manager Bob Melvin wanted to know why Baretta wasn’t awarded third base? To the satisfaction of Melvin, the umpires (Gerry Davis, Ryan Anderson, Pat Hoberg and Brian Knight) huddled and decided to place Baretta at third base. Giants’ manager Bruce Bochy then challenged the award of three bases. Bochy argued that Baretto should only get second base. Who was right? Melvin and the umpires who agreed that Baretto should be placed on third base or Bochy, who argued that the runner should only be awarded two bases on the play and be placed at second base? 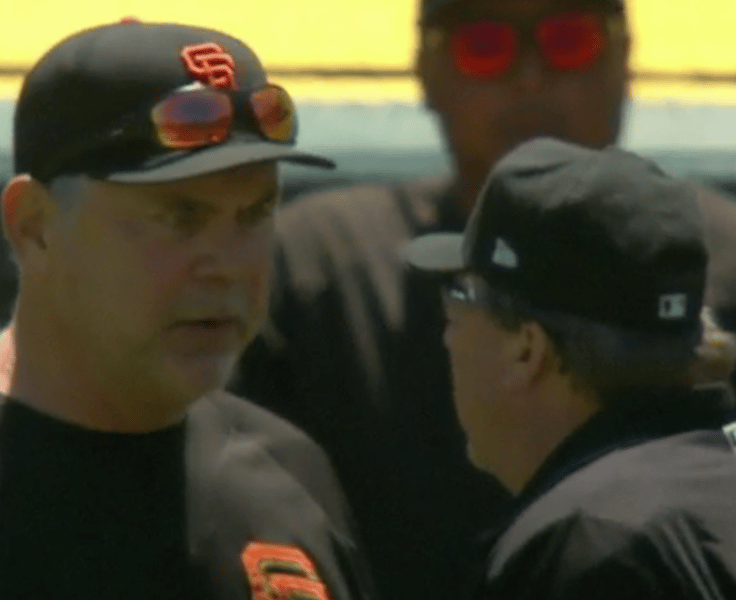 Bochy was correct. The Replay Official ruled that Baretto should only be awarded second base because Belt’s throw into dead ball territory was the “first throw” (or “first play”) in the infield. Therefore, Baretto should only be awarded second base. See rule 5.06 (b) (4) (G) and sections 19-20 of the 2018 MLB Umpire Manual. To review, the “first play” in the infield is what the fielder does after he fields the ball. Belt’s first play was the throw to first base, not the fielding of the deflection off Cueto’s glove. The deflection it itself is not a play. If Baretto had touched first base before the throw left Belt’s hand he would be awarded third base. The APPROVED RULING to rule 5.06 (b) (4) (G) reads, “If all runners including the batter-runner, have advanced at least one base when an infielder makes a wild throw on the first play after the pitch, the award shall be governed by the position of the runners when the wild throw was made.” If you look at the video again, this almost happened. It would have been a “rare” three base award on the first throw or “first play” in the infield. Because the deflections were unintentional, they are treated as if they never occurred. If Hundley’s deflection that forced the ball into DBT was intentional, then any runner would get two bases from their position on the bases at the time the ball was kicked or deflected. If Baretto had made first base, he would be placed on third base. If Hundley had complete possession of the ball and dropped it into dead ball territory before it went out of play, Baretto would be awarded two bases from his position on the bases at the time the ball was dropped. If Baretto had first base made, he would be sent to third base. Deflected thrown balls by a fielder that go out of play are treated like they were not touched unless the deflection is intentional which is very rare.